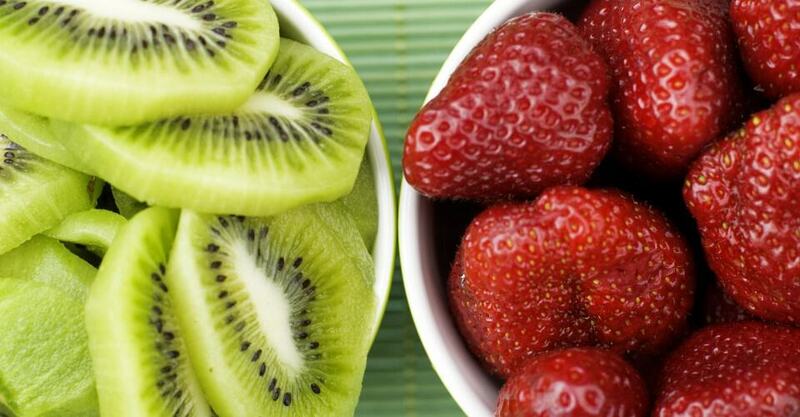 Which fruit has the most vitamin C: kiwis, strawberries, oranges or apples? First of all, you should note that the recommended dietary allowance, or RDA, for vitamin C is 75 milligrams for women and 90 mg for men. The RDA is established by the Institute of Medicine (IOM), an independent, nonprofit organization that works outside of government to provide unbiased and authoritative advice to decision-makers and the public. Some scientists believe that the RDA should be at least doubled, but you probably shouldn’t consume more than 200 mg per day because the research does not support mega doses (more than 1,000 mg per day) of vitamin C.
So, which has the most C? We looked at 100 grams, or about 3.5 ounces, for each fruit in order to make an accurate comparison. Apples have 52 calories per 100 grams and 4.6 mg of vitamin C. Kiwis have 61 calories per 100 grams and 92.7 mg of vitamin C. Strawberries have 69 calories per 100 grams and 37 mg of vitamin C, and oranges have 47 calories per 100 grams and 53.2 mg of vitamin C. So, kiwis win. Why is vitamin C important? It destroys free radicals, which can damage DNA and create cancers in our bodies; it helps boost our immune system by rallying white blood cells to fight off infection; and it even helps reduce heart disease by stopping plaque from forming. Which vegetable has the most fiber: broccoli, sweet potatoes, green peas or artichokes? Again, we looked at 100 grams, or about 3.5 ounces, for each vegetable. Broccoli has 34 calories per 100 grams and 2.6 grams of fiber. Green peas have 81 calories per 100 grams and 5.1 grams of fiber and sweet potatoes with the skin have 90 calories per 100 grams and 3.3 grams of fiber. Now check out these stats for 100 grams of artichoke: 53 calories and 8.6 grams of fiber. And why is fiber so important? Fiber-rich foods can help you lose weight for two reasons. First, fiber provides bulk, which makes you feel full. Second, it slows digestion, which makes you feel satisfied longer. How does this happen? Fiber postpones the gastric emptying of foods which may also reduce a rise in blood glucose concentrations and help diabetics with insulin sensitivity. 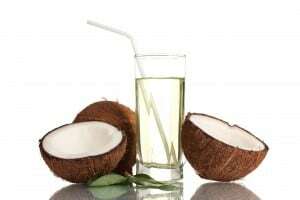 It also reduces the risk of heart disease and diabetes and lowers cholesterol. Plus, fiber increases stool bulk, which can help prevent not only constipation but also hemorrhoids and possibly colon cancer. The IOM recommends 14 grams of fiber per 1,000 calories consumed. So if you consume 2,000 calories, you should be getting 28 grams of fiber. The problem is that most of us don’t consume enough fiber. What’s the difference between yellow popcorn and white popcorn? Nutritionally speaking, there isn’t much difference. The values for the fiber content based on a single serving of 5 cups of popped popcorn are the same. Yellow kernels actually contain slightly more fiber than white kernels when you extend the values to 100 grams, but the difference is not significant. Yellow kernels contain more vitamin A than white, while white kernels test slightly higher for iron. So, what are the nutritional stats? These whole grains have only 100 calories per 5 cups, which also pack 7 grams of fiber. Not only that, but recent research from the University of Scranton found that popcorn is loaded with healthful antioxidant substances called polyphenols. Found in many fruits and vegetables, polyphenols help rid the body of free radicals that can cause damage to cells and tissues. I’ve heard that chocolate can stop a cough — is that true? Believe it or not, it is possible. But it’s dark chocolate that has the benefits, not milk chocolate. In fact, historically, many people including Nicolas de Blegny, doctor to the king of France in the late 1600s, have believed that chocolate can help with coughs. It is a great natural source of theobromine, which, according to researchers at the National Heart and Lung Institute at the Imperial College London, appears to be a natural cough suppressant. Dark chocolate also seems to be a bronchodilator. According to the journal Supportive Cancer Therapy, coughing is caused by an effect on C-fibers, which are part of our neural network, and theobromine suppresses that effect. Another supposed effect of chocolate is that it releases mucus in the airways, which can soothe a dry cough. How much do you need? Researchers say about 500 to 700 mg of theobromine twice daily. Dark chocolate (more than 60 percent cacao) has about 250 mg of theobromine per ounce, so we’re talking about 4 ounces per day. But watch out — that’s more than 540 calories per day.